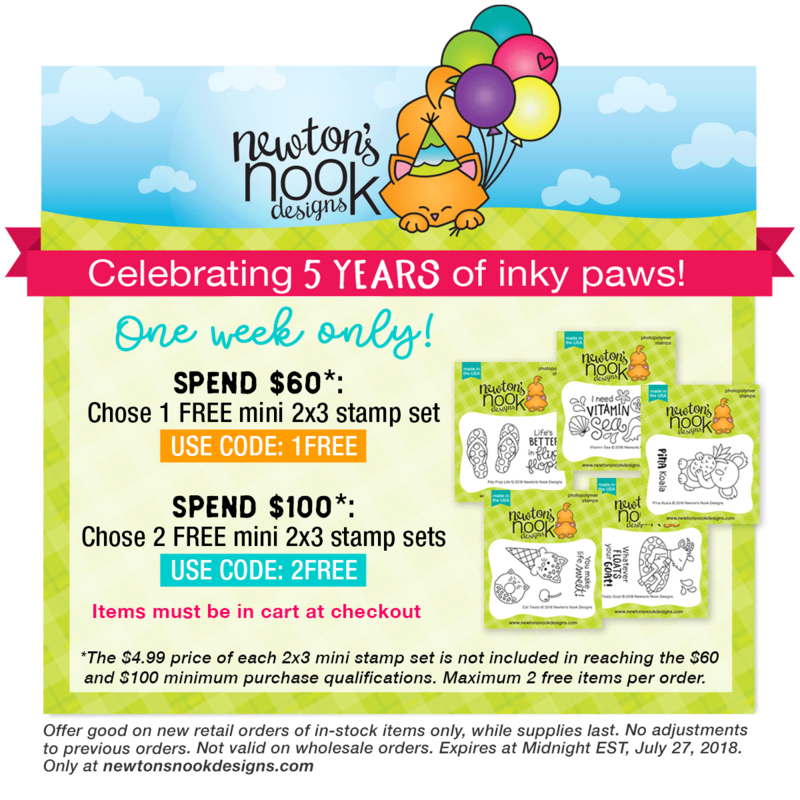 Hollybeary Creations : Newton's Nook Anniversary Bog Hop!!! Happy Friday everyone... 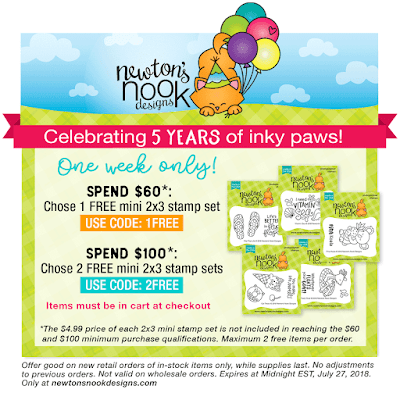 It's Newton's Five year Anniversary and we are so excited to be celebrating with a Blog Hop and a Special Sale. Be sure to hop along and leave comments along the way for a chance to win one of Five $25 Gift Certificates to the store we're giving away! 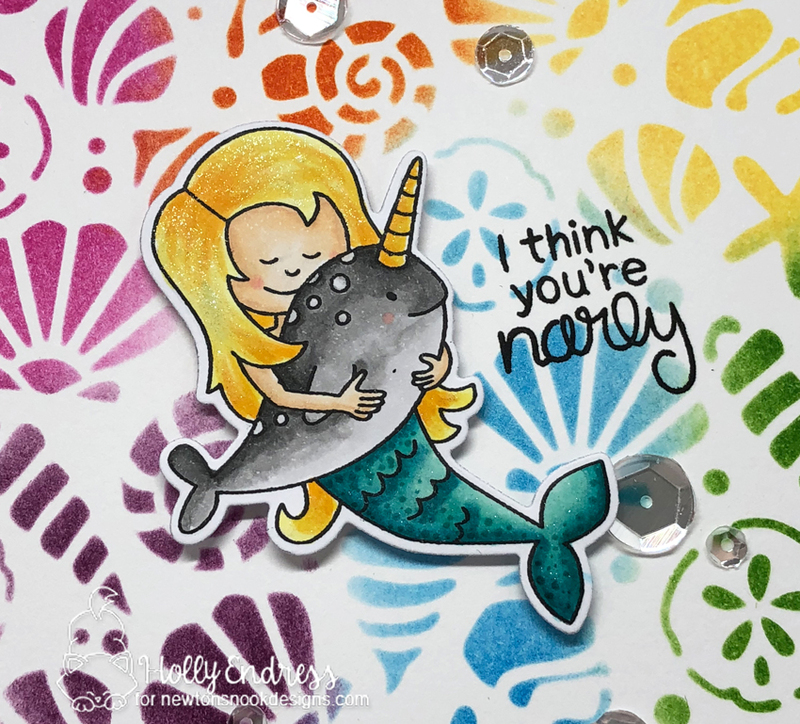 I created a Fun card for the Hop using the new Narly Mermaids Stamp and Die set and then new Seashell stencil. I created a background on a piece of Watercolor paper using the Seashell Stencil and several shades of Distress Inks. Then I stamped the sentiment in Black ink. I adhered the panel to an A2 size Card base and set it aside. Then I stamped the Mermaid image onto some X-Press It blending cardstock and colored it in with Copics. I used the coordinating die to cut it out. I adhered the image to the card with some foam tape and I added some Clear Wink of Stella to parts of the image and a few Sparkling Clear Sequins. This set is so cute!!! We have a great sale in the store to celebrate and you can find all the links for the hop below!!! Adorable mermaid card! Love the stenciling. very cute card//love all the colors. Love the colorful background! Thanks for the amazing inspiration week and all the fabulous projects!!!! I love the colorful background! Adorable mermaid card! Love the colorful background! LOVE the sparkle in the mermaids hair and the colorful stenciled background looks wonderful. Hi Holly! This is so fun! I adore the rainbow colors on the stenciled background and the mermaid and narwhale are colored so beautifully! Thank you so much for celebrating 5 years and hopping with us today! What a fantastic background you've made for this card!! I love the mix of colors!! Definitely makes me want this new stencil! Love the multicolored background of this card! So bright and cheerful! Awwww, this is such a gorgeous card, Holly! The backgroun is so fun yet so pretty with rainbow colors, and your mermaid and her narwhale friend are colored so beautifully! Love the little shimmer and sparkle from the glitter pen! too cute! love that sentiment and your design is awesome! Sweet card! Beautiful coloring! I love the background and the adorable mermaid! Adorable card, gotta love the uni-whale.... not sure what to call him but he is too cute. Such fun! Love the background! Awww, her face is so sweet!! This is beautiful. Love the colourful stencilled background! Beautiful card! Your card is adorable, I love your underwater rainbow ! The rainbow colors with the stencil is GREAT! I love that look! 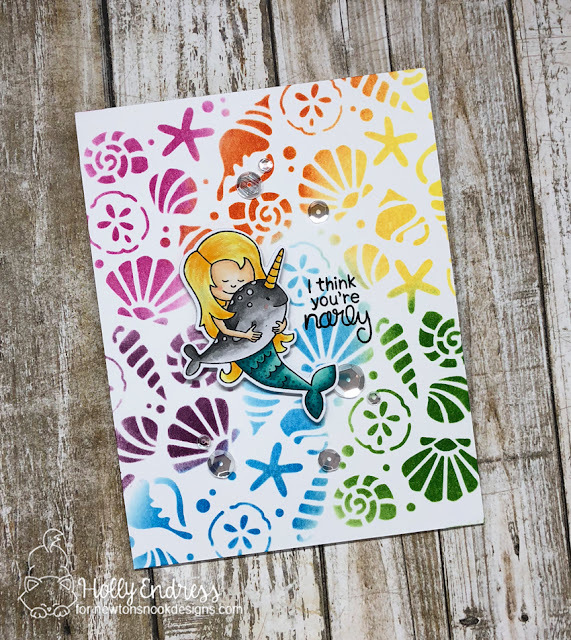 Wow that rainbow background is so pretty and works so well with this mermaid image. Such a fun bright background! Love the colorful sea shell background. Love all your Newton sets! Fantastic card! I love your background! You’ve made such a super cute card and so joyful with all the gorgeous colours ! Your background is just awesome ! !